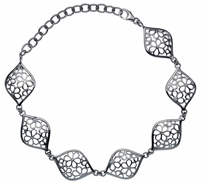 Choose from our beautiful necklace collection to adorn your décolleté! From extravagant statement necklets to delicate pendants set with diamonds and semi precious stones, we are always on the look out for new and exciting ranges to indulge in each season. All our necklaces are made from Silver or Gold with precious and semi precious stones and come packaged in a beautiful box and gift bag, perfect for a gift or equally as perfect to treat yourself!